Does your urine look like lemonade and smell nice? In this article I offer a simple two-week self-test for testing if you are dehydrated or have optimum hydration. I call this Dr. Ali’s Hydration Self-Test. This test will inform you about your state of hydration better than the most expensive and cumbersome laboratory test. First, some brief comments about the need for water. Optimal state of hydration is not merely the absence of thirst. The desire to drink-the thirst signal-does not indicate a physiological optimum. Rather, the presence of hydration is enough clean water in bodily fluids to facilitate all oxygen signaling and oxygen driven energy and detergent functions. Dehydration is the state in which water in sufficient amounts is not present to support all optimal oxygen roles in the body. This is not the textbook definition of dehydration. This is the view of hydration-and its absence-by my patients. What Type of Water Should I Drink Part One Majid Ali MD from Majid Ali on Vimeo. What Type of Water Should I Drink Part Two Majid Ali MD from Majid Ali on Vimeo. Are you dehydrated? or Hydrated? As a general guideline-a very rough estimate-I suggest the following: four quarts of fluid for a 150 lb. individual, three quarts for a 130 lb. individual, and five quarts for a 170 lb. individual. Is that a lot of fluid? Yes, it is. If you do take so much water and it causes some discomfort, you will reduce the amount. More likely, you will take three-fourths of the amount, and that would be fine. Most integrative physicians and practicing nutritionists will agree to my guidelines. How much fluid is necessary for optimal hydration? No one can answer the question for someone else. If you have never tested yourself for optimal hydration, you are most likely dehydrated for several hours during the day. Laboratory tests used for assessing the state of hydration of hospitalized patients are tedious and cumbersome. No such tests are available to doctors in their offices. The old idea of touching the protruding tongue of the patient to detect dehydration-well, truth be told-is silly. 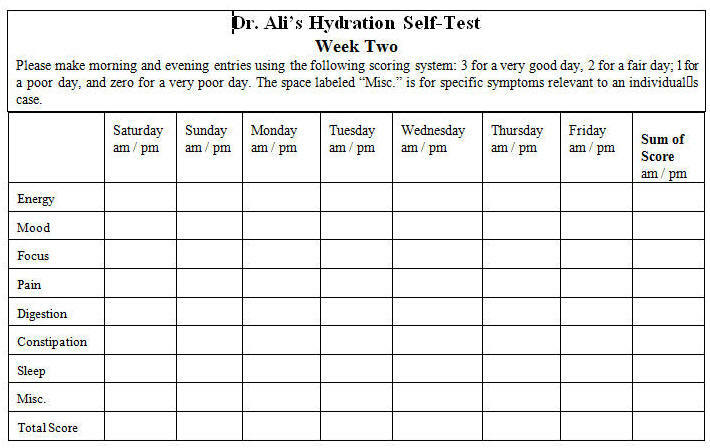 Several years ago, I developed a simple and useful method for detecting clinically significant chronic dehydration: Dr. Ali’s Hydration Self-Test. Again, this test will inform you about your state of hydration better than the most expensive and cumbersome laboratory test. Do not change your fluid intake pattern. Twice daily, record your own evaluation of the clinical assessment features listed in “Dr. Ali’s Hydration Self-Test Sheet.” The space labeled “Misc” in the sheet is for specific additional symptoms relevant to your health. Please use the following scoring system: 3 for a very good day, 2 for a fair day, 1 for a poor day, and zero for a very poor day. Increase the daily intake of fluids as follows: four quarts if you weigh about 150 lb., three quarts if you are 130 lb. in weight, and five quarts if you weigh more than 170 lb. Water, herbal teas, and vegetable juices are acceptable forms of fluids. Coffee, black tea, and alcoholic beverages are not appropriate for this test; total abstinence from such liquids is not essential. Begin recording symptom scores on the fourth day. This delay period is necessary to allow the state of hydration to adjust. 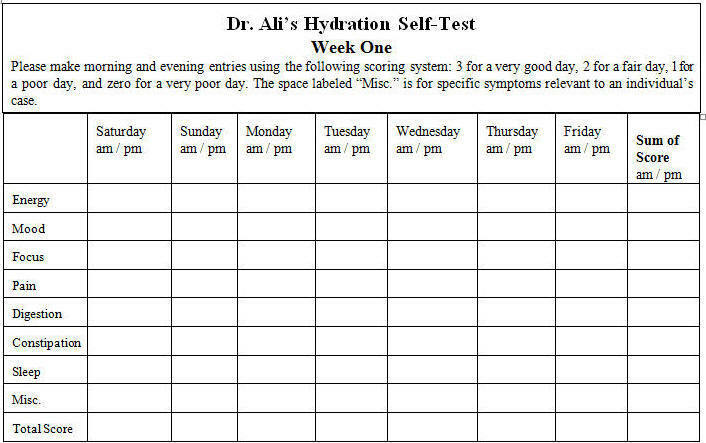 Make morning and evening entries on the hydration Self-Test Sheet using the same scoring system as for the first week of the test. Add the numbers in the blocks for each individual symptom, as well as total the morning and evening scores each day for the first and second week separately. Compare the numbers obtained with your regular fluid intake (week one) with those obtained after following the fluid guidelines (week two). Doctors, in general, are mute on the subject of water intake required for optimal hydration. There is a wide gulf between guidelines for optimal hydration offered by integrative physicians and doctors who do not practice nutritional medicine. The former are guided by their patients, while the latter follow medical textbooks written by professors who limit their work to drug regimens. Medical textbooks do not define clearly what optimal hydration might be and how it might be achieved. Consider the following quote from Wikipedia’s article on water: “Medical literature favors a lower consumption, typically 1 liter of water for an average male, excluding extra requirements due to fluid loss from exercise or warm weather.” This is about one-fourth of what I recommend for a 150 lb. individual. This is not where Wikipedia’s absurdity ends. Consider another quote: “The popular claim that “a person should consume eight glasses of water per day” seems to have no real basis in science. Similar misconceptions concerning the effect of water on weight loss and constipation have also been dispelled.” Dispelled by whom? Drug docs? In my clinical experience, insufficient fluid intake is the most common cause of chronic constipation. How do I know this? Because constipation clears up in most patients when I insist on overhydration during the morning hours. As for its other claims, what scientific principles of nutrition might Wikipedia be applying in its analysis? Consider one more quote: “It is not clear how much water intake is needed by healthy people.” So much for the science of Wikipedia! In closing, a clear understanding of one’s state of hydration is essential for lifelong fluid habits and the value of water therapies. The effort involved in conducting Dr. Ali’s Hydration Self-Test is well worth the results in knowledge and self-empowerment. The videos are in the *mov format. Now what does that mean? That means they will play on anything, tablets, android and iphones, PCs, even your TV if you have Internet TV capabilities! Typically, all your newer devices are ready to play these videos, however you may need a quick and free upgrade from QuickTime from Apple. What does this mean? It means easy technology! No matter what you’re watching or where you’re watching it, QuickTime technology makes it all possible! After you purchase the videos – they should download and play.